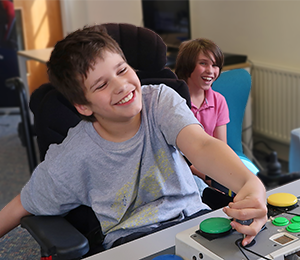 You wonderful GameBlasters have raised a whopping £100,000 to level the playing field for people with disabilities! Ceyda’s so happy to be able to join in with her family and friends. All her life her cerebral palsy has stopped her being included in the magic of gaming. But now, with a custom controller setup from SpecialEffect, she’s having the time of her life. YOU DID IT!!! You’ve smashed the GameBlast19 target of £100,000! Please take a moment to watch this message from our CEO Dr Mick Donegan…. Thousands of people with physical disabilities miss out on the magic and inclusion of video games because they can’t use a games controller or keyboard. You can change their lives by organising your own GameBlast gaming marathon or fundraising event. Let’s get people playing again! Ultimate Pro Gaming are Blasting!